BENJAMIN ZUSKIN (April 28, 1899, Ponevezh, Lithuania – August 12, 1952, Moscow), a fascinating actor of GOSET, The Moscow State Jewish (Yiddish) Theater, was called “one of the most dazzling talents in world theater in the first half of the twentieth century” – by the critique, and a “treasure of expressiveness” – by Marc Chagall. Born to a tailor’s family, and during World War One expulsed with his family from Lithuania, he studied mining engineering in Yekaterinburg and afterwards in Moscow. He left these studies in 1920, at the age of twenty one, to join this Theater which then was freshly established and up to 1928 brilliantly directed by Alexey Granovsky. Later, Zuskin also worked as a film actor and a director of theatrical productions and variety shows, and taught in the Jewish acting studio. He had received the honorary title of People’s Artist of Russian Soviet Socialistic Republic, and the highest Soviet award – Stalin Prize. Zuskin’s acting style embodied the grotesque irony advocated by Granovsky. At the same time, he added original psychological dimensions to the roles he played, conveyed through nuanced improvisation and a striking sense of rhythm. In particular, he captured the simultaneously tragic and comic contradictions of Jewish characters. Throughout his carrier, specializing in roles that were both earthly and melancholic, he provided a crucial counterpart to the dramatic pathos of Solomon Mikhoels, GOSET’s principal actor and – from 1929 to 1948 – artistic director, and Zuskin’s onstage partner and lifetime’s friend. During the World War Two, Zuskin became member of the Jewish Anti-Fascist Committee while Mikhoels was appointed its head. After the war, Stalin dismantled the Committee, and arranged to have Mikhoels brutally murdered in a staged accident in January 1948. From then, Zuskin served as artistic director of GOSET. It was not for long. In December 1948 he was hospitalized – his nervous condition to be treated with sedative pills – and on the night of December 23 to 24, arrested while sleeping in the hospital. He was kept in custody, under interrogations and tortures, during three and a half years, and in July 1952 a trial was held behind closed doors, without a prosecutor, without defense attorneys, without witnesses. Benjamin Zuskin, together with twelve eminent Soviet Jews including four outstanding Yiddish poets, was charged with “high treason” and “Jewish nationalism”, and executed in the event now known as the Night of the Murdered Poets on August 12, 1952. In 1955 he was posthumously rehabilitated. Zuskin was married, from 1920 to 1922, to Rachel Holand (1900 – 1943), and, from 1925 to the end of his life, to GOSET’s actress and assistant choreographer Eda Berkovskaya (1903 – 1959), and fathered two daughters, DrMed Tamara Platt (1921 – 2014), from the first marriage, and Ala Zuskin Perelman, from the second. His further descendants are three grandsons and seven great-grandchildren. 1921 March: Entered as an actor in the Moscow State Jewish Chamber Theater, GOSEKT, renamed hereafter (1925) in Moscow State Jewish Theater, GOSET. 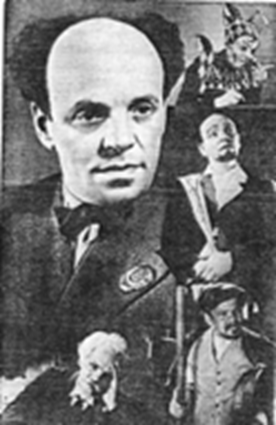 Benjamin Zuskin was the Jewish actor performing on the stage of the Jewish Theater in Moscow. I am telling about Benjamin Zuskin not only because of him being my father, but also out of a strong feeling that his personality and fate do focus the main traits of his profession, era, and people. First of all, I would like to note, that in a totalitarian state, the theatre is not merely a place for entertainment, but rather a place in which a message can be sent out in veiled language that one would not dare to write on paper or to speak out loud for fear of the authorities. This may be true for all theaters in such a state, but is especially true for a Jewish theater during the time period in question. The Jewish Theater in Moscow was established in 1919, a short time after the Communist-Bolshevik revolution, when the new regime was interested in the development of the "ideological front" and encouragement of various segments of the population. During the 30 years of its existence – the theater closed in 1949 — in an atmosphere of increasingly strong forced assimilation, this theater was a source of succor for the Soviet Jews, due to the Jewish messages it provided, both obviously or latenly, as well as for its stellar artistic level. The theater was born thanks to two factors – government support, both financial and practical, and the appearance of Alexei Granovski, who established the theater and, for the first ten years of its existence, directed all of its plays and acted as the Artistic Director. Due to his education, experience and talents, Granovsky was received as a star, and as a dizzying director but also as someone who was educated in a non-Jewish environment, first in Petersburg and then in Germany. His knowledge was general-humanistic rather than Jewish. Mikhoels, and later Zuskin, and other actors brought a Jewish flavor to the theater. The theater's first painter, whose creations decorated the walls of the auditorium and its ceiling and curtain, who designed the sets, costumes and makeup for the first play in the history of this Moscow theater, was Marc Chagall. He wrote: "The actors, like the figures in my paintings, will express traditional Jewish feelings in a modern style". Zuskin came to the theater at the age of 21. Before this he had not studied acting, and had only performed in amateur productions. At this time, he was studying mine engineering and supporting himself working as a clerk. Upon his arrival at the theater, Zuskin is accepted in the studio, leaves his engineering studies and within three months becomes one of the company's actors. Within another three months, he already appears on the stage in one of several one-act plays that form An evening of Sholem Aleichem. One year later, in 1922, there is a new production at the theater – a classic Jewish play, The Sorceress based on Goldfadn. The Sorceress, as always, is casted by a man – in this case by Zuskin. In the morning after the premiere, Zuskin wakes up as a famous actor, and henceforth, his name precedes him. According to Granovski, this play clearly expressed the young theater's main point – to show the past in the present style. What is this "present style"? What was Granovski's method? Granovski designed the play as a symphony; the place of the musical elements having or falling on an ongoing continuum, caught the text, the actors' actions, the set, the lighting, the wording, the mise en scene and the pauses. Like a conductor of an orchestra, Granovski knew how to conduct scenes with many participants, so that each one had his own character and yet was also part of the whole. To compare – once it was said of Zuskin: "In each role that he plays, Zuskin captures the whole, even when each detail of his acting was an event in and of itself". (I’ve said in the beginning that Zuskin focuses the main traits of his profession). In the play The Sorceress, the grotesques presented everything with great exaggeration. Zuskin was a good designer and used to design by himself the make-ups for his personages. For The Sorceress he invented a pointed nose and owlish eyes. He has even make-upped his hands so, that the fingers looked too long, which became obvious when The Sorceress springs, as if she flies, and stretches out. Then, her wide spread fingers remind claws of a bird of pray trying to catch a chick. During the GOSET’s tour in Paris, one of local top cosmeticians was so excited with such an invention, that started to apply it to his ladies-clients’ fingers making them more long, fancy and elegant. Thus, even the famous Paris fashion could not going on… without Zuskin! When asked what he liked in the role of The Sorceress, Zuskin replied, among other things, "The possibility of making a Jewish small town, part of our heritage, into a laughingstock entranced me". Later, a famous German critic wrote: "It appears as though the theater has made a laughingstock of the past, however this is not the case, as laughter of Jews about their tradition is itself an ancient Jewish custom". In 1927, the theater presents The Travels of Benjamin The Third by Mendele Moykher Sforim. The main protagonists, Benjamin and Senderl, were like a Jewish Don Quixote and Sancho Pancha, not externally, but rather in an internal, spiritual manner. They go out of their shtetl to find “Red Jews”, to find the Promised Land. In one of the scenes, we see the two tired travelers trying to sleep nearby an inn. They are hungry and are speaking about meals. Finally they fall asleep, and found themselves in a fantastic country. In the words of a critic, "The inspired Mikhoels-Zuskin couple leads the whole play. Their ridiculous earthly plots paled in comparison with the sublime, tragic plots of their souls. At the end of the premiere, the audience rose as one and the auditorium thundered". The role of Senderl became the one that Zuskin loved best of all the roles that he played on the stage and in the movies. Thus, when I wrote the book about him, I couldn't help but call it The Travels of Benjamin Zuskin). The dizzying success of "The Travels of Benjamin the Third" brought the authorities to the decision to send the theater on a tour of shows around Western Europe, in order to present the accomplishments of a nation that was previously considered suppressed. They toured in 1928. In Europe, theirs was a victory parade. This is indeed a theater of international level. Before our very eyes appear a dramatic theatre, a fine entertainment, a circus and also… the spirit of a human being. This is a miracle with no precedent. It cannot be compared with anything else. Everything moves so quickly, turns, tilts, climbs, wanders, rolls, makes one laugh and then cry, falls down and gets up once again. Fascinating. The Travels of Benjamin the Third… is the pinnacle of world Jewish theater to this very day. Zuskin is truly a discovery for us. Elegant precision, innocence, wisdom and intuition… He stands out above the rest of the company. In Zuskin's acting, there are moments that are just unforgettable. Zuskin illuminates his characters in a unique light; he leaps and jumps, like a child. Blessed is the theater that has children like these! Along with the increasing success, suppressive instructions and comments are received from Moscow such as: the actors behave in too free a manner, the heads of the theater are meeting with "traitors to the homeland" (with those who left the Soviet homeland and have not returned), and so forth. Neither the actors nor those who sent them letters with false accusations understood that something was concealed in their acting, in which the rhythm of every note, every turn and every movement in their rich work were "loaded". Neither the actors, nor those who preached morals to them were aware of something written by someone in the sidelines: "The entire company has a sense of rhythm that is unique and totally foreign to the Bolshevik atmosphere". In any case, the performance tour was cut short and the company returned to Moscow – without Granovski, who stayed in the West. abandoned, and that a Soviet repertoire be produced. During this period, there were no plays in Yiddish about Soviet subjects (e.g., on the status of the workers), and these began to be written hurriedly, such that they were not always of a particularly high level. Nevertheless, there were some successes. After Mikhoels played in King Lear, he began to lecture in various forums – about Shakespeare, the art of the theater, and different broad topics. His lectures were brilliant and he became a speaker in great demand, both respected and popular. Zuskin remained within his field, field of acting. Even though, he also broadened the range of his pursuits. He began to teach at the School of Acting. As in each of his roles, even in Shakespeare's Fool, he expressed some Jewish message and he aspired to bring this message to the consciousness of his students. One of his former students was telling about how outstanding was Zuskin as a teacher: “He was teaching us as Leonardo Da Vinci or Michelangelo were teaching their pupils – without concealing any of the secrets of the art”. In addition, Zuskin began to stage theater plays and also, a little later, entertainment shows. A non-Jewish lady-singer whose repertoire included songs of various nations, among them some songs in Yiddish, recalls: "Zuskin taught that a singer needed talent, intuition, control over his/her art, and an orientation toward the broadest possible multicultural boundaries. The work with him was, for me, a kind of university at the highest level. Zuskin also starred on the silver screen, in Russian language movies on Jewish topics. In 1941, World War II reached the Soviet Union and in 1942 a Jewish Anti-Fascist Committee was established – by the authorities, of course, in order to turn to the Jews in the West and to win moral and financial support for the Soviet people who fought against fascism. Mikhoels was appointed head of this Committee, Zuskin – Committee’s Presidium member. Among the roles that Zuskin played at the height of the war and immediately afterwards, I would like to mention two that were very important from an artistic perspective, and were also important as representing Jewish fate. The first one was in the film The Unvanquished, the only film during Stalin's time that showed the execution of the Jews in Babi-Yar. Zuskin's character, Doctor Fishman, was one of these Jews. When Dr. Fishman looks back from inside the procession of Jews to Babi-Yar, it seems to be my father saying farewell to me. That is, the correlation with what happens in the Holocaust to what happens to my father after the war is strikingly similar… (I’ve said at the beginning that Zuskin focuses the main traits of his era and people). The second role was in the play Freylekhs which in Yiddish means "merriment”, mostly on festive occasions such as wedding. My father portrays the role of the entertainer who out the outset blows out the candles that are lit for victims of the Holocaust and immediately after, leads the wedding. What, after all, is better than a wedding to respect the memory of those who have died? A wedding is the creation of new life. When the war ended and the Jews who survived began to return to their cities, in many places it was not easy for the Jews to find dwellings, to be accepted into universities or even to find workplaces. And they began to turn to the Jewish Anti-Fascist Committee. Those on the Committee tried to help them, even though this was not in fact part of the Committee's function. Zuskin because of the characteristic responsibility he felt, did everything that was requested of him in the Committee framework. However, he rarely participated in the meetings of the Committee as he was busy performing on stage (Mikhoels was the Artistic Director and stage director at the time but was not acting anymore), and when he did participate, he felt he was an "extra", as he used to say in his "actor's language". He became increasingly sad because he felt, due to his highly developed intuition, that involvement in such matters was not for them and did not bode well. He claimed that his mission and the mission of the theater was to act, and through this, not to let the Jews forget that they were Jews and to contribute to their morale after the tragedies of the war and also — perhaps — before the tragedies to come. Even these days Zuskin kept joking, now and then – out of either some intrinsic trait of him, or a will to alleviate doubts and evil forebodings. One night, on November 1947, after a long rehearsal was over and other actors left, Mikhoels invited Zuskin in his working room and ordered him – with no words but a kind of King Lear gesture – to sit down in his, Mikhoels’s, armchair. A playful smile appeared on Zuskin’s face: he thought that Mikhoels wanted the both of them to joke, as they used to do. But Mikhoels said very seriously: “This place will be yours very soon”. “Mine?! No!”. “Look at this”. It was an opened letter. “Dirty Jew, you have climbed too high, be aware – your head may fall dawn!”, read Zuskin, and froze. But externally…he even paid no attention that he was still smiling. Less than two months after this conversation, Zuskin’s smile was erased forever. On January 13, 1948 Solomon Mikhoels was murdered. They said it was a car accident. After a few months, the Committee was abolished, after that, the Yiddish publishing house. Zuskin was arrested on December 23, 1948. The Moscow State Jewish Theatre has been closed in 1949, already with neither Mikhoels nor Zuskin. "I wondered about the tragic fate of them both", wrote one of their contemporaries, "and maybe now I understand that Mikhoels and Zuskin were killed in great part because they were actors. They threatened Stalin's regime due to the intuition and high level of sensitivity that is often felt by actors; they had figured out the essence of this boundless totalitarian regime". In my opinion, there is justice in what he said, and it was not by chance that I began today by saying that in a totalitarian regime, the theater is not merely a place for entertainment. However, I would add that they were not just actors, but also Jews, and their deaths were not just deaths but rather, deaths as Jews. After Mikhoels, Zuskin became Artistic Director of the theater, which this time had almost no audience, since most of spectators were afraid of a “plagued” place, no decent budget, no hope. His nerves were broken, and he was hospitalized. Straight from the hospital, while he was under the influence of sleeping pills, he was taken, enveloped in a blanket, to the internal prison of the KGB. How can one imagine a man who falls asleep in a neat and white hospital bed and wakes up in a gloom of a jail?! Behind bars, he spent three and a half years – of interrogation and torture – and afterwards, there was a trial held behind closed doors, without a prosecutor, without advocates and without witnesses. Thirteen members of the Committee were tried and "found guilty", with a common verdict, in which each person had a short section regarding him personally, and with a common death sentence. The sentence was carried out on August 12, 1952. I hope that this topic, that of Benjamin Zuskin and all he represents, will become a subject for study and research. For this reason, I wrote the book about him. That is, Zuskin and the others who were killed together with him were in fact assassinated twice – once physically, when they were executed, and once due to the fact that their names and lifework have been forgotten. Therefore my objective is, at least to try to dissipate this forgetfulness. Let us remember Zuskin not as a victim, or at least not only as a victim – but rather as an actor, about whom it has been said, "Benjamin Zuskin, one of the greatest talents in world theater in the first half of the twentieth century". Even nowadays, after having watched records of Zuskin on stage, and a movie in which he starred, a young actor said: "Whenever we see Zuskin performing he is always grasped contemporary. Zuskin is one of a kind, he is a gift of The Lord”. "ZUSKIN IN MY MIND's eye"
There are people who are the foundation for the existence of the Moscow State Jewish Theater. One such person was Mikhoels, whom I imagine everyone has heard of. And there is another such person, Benjamin Zuskin, and only a few have heard of him. And it is not a coincidence. The first, Mikhoels, was a man who was abundantly self-confident. The second, Zuskin, was an actor divinely gifted. After almost every production, he was not convinced that he had given all that he could have. There were directors, and not only Jewish directors, who attested to that. For example, one of them related how after the production of King Lear, Zuskin, who had played The Fool superbly, said to him, I am not going to appear on stage any more because my acting today was not all that I would have wanted it to be. Not always sure of himself, hesitant, as far as I was able to learn about him. An actor of extraordinary talent, who joined the theater at the age of twenty-two, who had hardly studied acting but had absorbed the way of life of the Jews which was full of pain but also full of humor, wisdom, a slightly amused attitude through the pain. And to a ‘little man’ who had a bit of this and of that Zuskin gave expression in his roles, or at least in some of them. He is the Jewish Sancho Panza in The Travels of Benjamin the Third, he is the Fool in King Lear, he is the Badchen in Freylekhs, which was staged in the theater in 1945. After the enormous tragedy, when there was a stark sense that the Jewish people had ceased to exist, the theater put on Freylekhs. Freylekhs is a Jewish wedding. What is a wedding in Jewish tradition? The continuity of life, the continuity of family, the birth of a people. New growth. The theater staged the Jewish experience with folk dances, folk songs, the whole way of life a people leads. The character who led this production was the Badchen. This man whom I have tried to portray in a few words – it is upon him that a grave and serious role falls, perhaps the hardest of his life. On January 13, 1948, I don’t know what they announced – accident, not an accident, I don’t really know – Mikhoels was murdered. In the theater confusion reigned. The actors are wandering about the theater and they don’t know what to do. There is no leader, there is no one to show the way. In those moments, crucial moments for the fate of the theater, Zuskin feels that it is his responsibility to take up the burden. The theater’s situation is grim: there is a sense of despair. There is whispering in the administration and among the actors, What will be? The rumors that Mikhoels was murdered are known. However, this is whispered only in secret. At the same time, the theater is cut off from state funding. They say: the theater has to survive on its own revenues. But the theater cannot survive that way. That is on the one hand. On the other hand Doctor Rapoport, one of the detainees in the Doctor’s Plot, writes: at the institute where he worked, there were rumors that he had a subscription to the Jewish theater. He did not have a subscription to the theater. The theater did not interest him, but that was enough to arouse suspicion that there was something wrong about him. That is to say, on the one hand they cut off the theater from the state budget and didn’t give it a chance to subsist, and in the other, the atmosphere was such that everyone who bought a subscription to the theater was considered a suspect. And in those very difficult days when the theater still managed to hang on, days that are not always given any attention, Benjamin Zuskin shouldered the burden. This was perhaps THE role of his life. With clenched jaw, he held out and guaranteed the continued activity of the theater for almost a whole year. His hesitations, doubts, all of the pain and the torment – all of these he did not let actors see, of course, did not share them with his staff so as not to demoralize them. But it broke the man. The man stopped sleeping at night, and in order to cure him, they hospitalized him in one of the medical clinics and there they anesthetized him in the hope that a sleep of a few days, or a few days and nights, would benefit him. From this clinic he was taken by the secret police on a stretcher, as he lay sleeping. Can we ever imagine the feeling of the man when he was removed from the clinic where he was being treated in his sleep and woke up in the torture chambers?